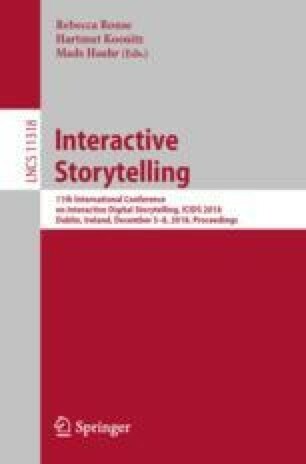 We are at a milestone moment in the development of the cultural form of Interactive Digital Narrative (IDN), and in the development of the study of IDN as a field of academic research and graduate education. We can date the beginning of the field to the late 1960s with the release of Joseph Weizenbaum’s Eliza in 1966, and recognize the late 1990s as another turning point when 30 years of diverse development began to coalesce into a recognizable new media practice. For the past 20 years we have seen accelerated growth in theory and practice, but the discourse has been split among contributory fields. With the convening of IDN as the focus of study in its own right, we can address key questions, such as its distinct history, taxonomy, and aesthetics. We can also recognize more clearly our unique challenges in studying a field that is evolving rapidly, and from multiple intersecting genetic strains. We can also articulate and investigate the potential of IDN as an expressive framework for engaging with the most pressing themes of human culture of the 21st century, and as a cognitive scaffold for increasing our individual and collective understanding of complex systems.